Painting of the Guelph and Ghibelline families, by Ottavio Baussano (Asti). 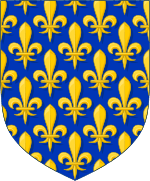 The Guelphs and Ghibellines (/ɡwɛlfs/; /ˈɡɪbᵻlaɪnz/, also US /ˈɡɪbəliːnz/, /ˈɡɪbələnz/; Italian: guelfi e ghibellini [ˈɡwɛlfi e ɡɡibelˈliːni]) were factions supporting the Pope and the Holy Roman Emperor, respectively, in the Italian city-states of central and northern Italy. During the 12th and 13th centuries, rivalry between these two parties formed a particularly important aspect of the internal politics of medieval Italy. The struggle for power between the Papacy and the Holy Roman Empire had arisen with the Investiture Controversy, which began in 1075 and ended with the Concordat of Worms in 1122. The division between the Guelphs and Ghibellines in Italy, however, persisted until the 15th century. 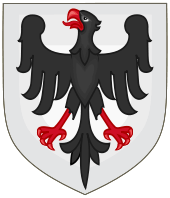 At the beginning of the 13th century, Philip of Swabia, a Hohenstaufen, and his son-in-law Otto of Brunswick, a Welf, were rivals for the imperial throne. Philip was supported by the Ghibellines as a relative of Frederick I, while Otto was supported by the Guelphs. Philip’s heir, Frederick II, Holy Roman Emperor, was an enemy of both Otto and the Papacy, and during Frederick’s reign the Guelphs became more strictly associated with the Papacy while the Ghibellines became supporters of the Empire, and of Frederick in particular. Frederick II also introduced this division to the Crusader states in the Levant during the Sixth Crusade. After the Sixth Crusade, Frederick II quelled a rebellion led by his son Henry in Germany, and soon Invaded Lombardy with a large Army, Pope Gregory IX attempted to stop the Invasion with diplomacy but failed, Frederick defeated the Lombard League in the Battle of Cortenuova and refused any Peace treaty with any of the Guelph States, he then laid to Brescia but was forced to lift it, he was then excommunicated by the Pope, and in response expelled the friars from Lombardy and placed his son Enzo as Imperial vicar in Italy, he quickly annexed Romagna, Marche, and the Duchy of Spoleto as well as part of the Papal States. In the meantime Frederick marched through Tuscany hoping to capture Rome, however he was forced to retreat sacking the city of Benevento, soon however the Ghibelline city of Ferrara fell and Frederick once more marched into Italy capturing Ravenna and Faenza, The Pope called a council but an Imperial-Pisan fleet defeated a Papal fleet carrying Cardinals and prelates from Genoa in the Battle of Giglio and then Frederick continued marching towards Rome however Pope Gregory soon died and Frederick seeing the war being directed against the Church not the Pope, withdrew his forces releasing two cardinals from Capua, although Frederick did again march against Rome over and over throughout 1242 and 1243. A new Pope Innocent IV was elected, at first Frederick was content with the election since Innocent had relatives in the Imperial camp, however Immediately the new Pope turned against Frederick, when the City of Viterbo rebelled the pope backed the Guelphs, Frederick immediately marched to Italy and besieged Viterbo the Pope signed a Peace treaty with the Emperor relieving the city, however after the Emperor left the Cardinal Raniero Capocci the leader in Viterbo, had the Garrison massacred, the Pope made another treaty but he immediately broke it and continiued to back the Guelphs, the Pope also supported Henry Raspe, Landgrave of Thuringia as King of the Romans and soon plotted to have Frederick killed but this failed and the Pope fled to Liguria, however soon things turned bad for the Imperials, the Lombard city of Parma rebelled and Enzo who was not present asked his father for help. Frederick and Ezzelino III da Romano the Tyrant of Verona besieged the city, however the Imperial Camp was ambushed by the Guelphs and in the ensuing Battle of Parma the Imperials were routed, losing much of their treasury, Frederick retreated and gathered another Army but the resistance of Parma encouraged other cities to rebel and frederick was powerless to do anything, things turned worse for the Imperials, the Ghibellines were defeated in the Battle of Fossalta by the Bolognese, where Enzo was captured and Imprisoned where he would die, although the Ghibellines did start recovering defeating the Guelphs in the Battle of Cingoli, Frederick by then was ill, however, before he died much of his territory was recovered by his son Conrad, King of the Romans, thus leaving Italy at peace for very few years. After the Guelphs finally defeated the Ghibellines in 1289 at the Battle of Campaldino and at Vicopisano, the Guelphs began infighting. 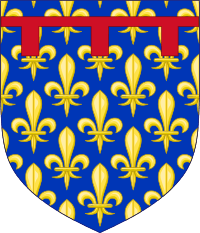 By 1300 the Florentine Guelphs had divided into the Black and White Guelphs. The Blacks continued to support the Papacy, while the Whites were opposed to Papal influence, specifically the influence of Pope Boniface VIII. Dante was among the supporters of the White Guelphs, and in 1302 was exiled when the Black Guelphs took control of Florence. 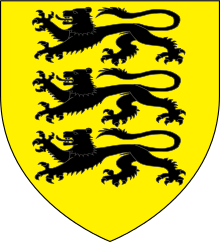 Those who were not connected to either side, or who had no connections to either Guelphs or Ghibellines, considered both factions unworthy of support but were still affected by changes of power in their respective cities. Emperor Henry VII was disgusted by supporters of both sides when he visited Italy in 1310. 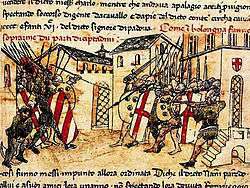 In 1325, the city-states of Guelph Bologna and Ghibelline Modena fought over a civic bucket in the War of the Bucket, where the famous Battle of Zappolino was fought. 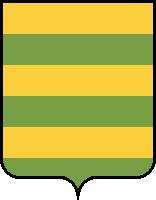 Modena's victory in this battle, and therefore the war, led to a resurgence of Ghibelline fortunes. 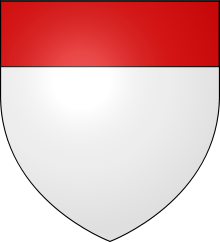 In 1334 Pope Benedict XII threatened people who used either the Guelph or Ghibelline name with excommunication. 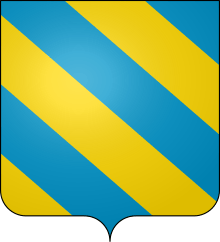 On 25 March 2015 the Parte Guelfa has been reconstituted as Christian order and archconfraternity to serve the Catholic Church and the Catholic Archdiocese of Florence, guided by the Captains Andrea Claudio Galluzzo, Riccardo Mugellini, Tommaso Conforti, Nicola Biagi and Gabriele Malquori under the custody of Consul Luciano Artusi. 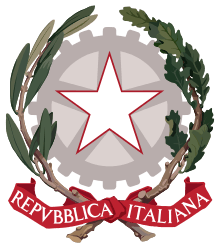 The Mayor of Florence established the headquarters of the reborn Guelph Party in the historic Palazzo di Parte Guelfa in the city. In Dante Alighieri's Inferno (1300s), participants in the conflict are featured prominently. For example, Mosca dei Lamberti is the character suffering in hell for the schism for which he was held responsible. In The Decameron (1350s) by Giovanni Boccaccio, one of the ladies is a firm adherent of the Ghibellines to the point where she will not even praise Charlemagne. In the notes to the poem The Shepheardes Calender (1579), English poet Edmund Spenser's annotator E. K. claimed (incorrectly) that the words "Elfs" and "Goblins" derive etymologically from Guelphs and Ghibellines. Valperga (1823) is a historical novel by Mary Shelley influenced heavily by both Dante and Boccaccio, that deals directly with the Guelph and Ghibelline conflict. 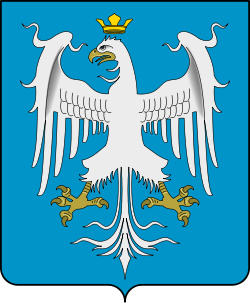 Its central figure, Castruccio Castracani, is a Ghibelline, while his love, the Duchess of Valperga, is a Guelph. In The Cantos (1915–1962), Ezra Pound makes repeated mention of both Guelfs and Ghibellines. The pro-Papal Guelfs are associated with usury and corruption while the pro-Imperial Ghibellines are associated with law and order. The famous "fascist" canto, LXXII, makes mention of Ezalino (who would appear to be the sometime-Ghibelline leader Ezzelino III da Romano), "who didn't believe the world was made by a jew" (i.e., he rejected papal and Christian claims and embraced the antisemitism of World War II in the fascist milieu in which the Canto was written). In Christ Stopped at Eboli (1945), Carlo Levi compares the peasants and gentry of Agliano Terme to the Guelphs and Ghibellines, respectively, with the Fascist government as the Holy Roman Empire and the desire to be left alone for local rule as the Papacy. In The Quentaris Chronicles fantasy book series (2003–2009), the Duelphs and Nibhellines are feuding families based on the Guelphs and Ghibellines. 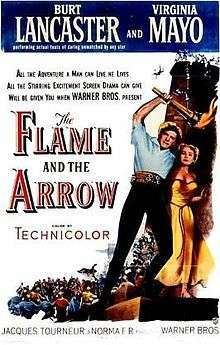 The Flame and the Arrow (1950) starring Burt Lancaster, Virginia Mayo and Nick Cravat is set in the Guelph and Ghibelline era of 12th century Lombardy. ↑ Tolfo, Maria Grazia; Colussi, Paolo (January 23, 2009). 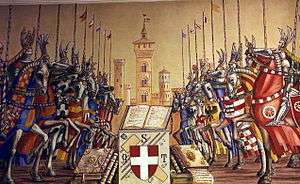 "Storia di Milano ::: dal 1426 al 1450" [History of Milan ::: from 1426 to 1450]. Storia di Milano (in Italian). Milano: Storiadimilano. Retrieved May 6, 2010. ↑ The Complete Book of Heraldry by Stephen Slater (ISBN 1843096986), page 201. ↑ …bei ihnen (Weibern) nur eine entscheidet, nämlich: welchem Manne sie gefallen haben. ↑ Schon beim Begegnen auf der Straße sehn sie einander an wie Guelfen und Ghibellinen.